Stroud is located in Gloucestershire in the south west of England. It was created in 1955 and has been a bellwether constituency since 1979. The current member of parliament is the Conservative party’s Neil Carmichael, who has served since 2010. I live here, my family are here and I’ll do what I’ve always done make myself fully available to constituents. 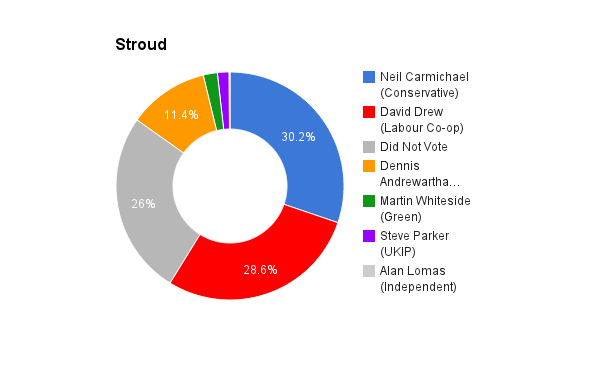 I have a long association with the Stroud constituency and will provide strong leadership that is rooted in the community. Got more personal photos in local newspapers than you could possibly count. No – it’s a syllogistic. We need to deal with the free migration of labour and capital and then immigration will be less of an issue. By increasing the wages of lower and middle income people redistributing from the rich. Fund it properly, integrate social care and stop the privatisation and dismantling. Training, job guarantees and proper wage levels for young people. Yes, but there are many levels of representation. Vote to leave until and unless the EU dumps neo-liberalism.